There are a lot of choices as to how you arrive at the park, and where you start or finish your walk. So first, you need to look at a map! There are five main villages in the park along the coast. But not all villages are easily accessible by car. They all have railway stations though, and a train runs through tunnels between the villages. I found a free parking possibility near the northernmost town of Monterosso, so we went to check that out first. Sure enough, there is free parking is available at GPS 44.145232, 9.664653 and from this location we could easily connect to the main coastal trail. Not many spots though, so better to arrive early...especially as busy season approaches. Otherwise, there is pay parking available in Monterosso. We set out heading south towards the town of Vernazza. Unfortunately there was no sign of the sun! The photos would have been so much better with blue sky and sunshine, but it wasn't meant to be. The trail wasn't very busy...yet. It was 9:20am when we started out. 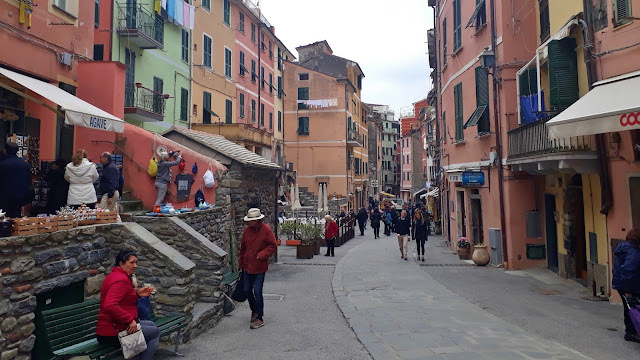 Our plan was to walk through the four villages to the south and end up at Riomaggiore and then take the train back to Monterosso and hike back up to the car. There are certainly some nice views! Arriving at the village of Vernazza. We arrived at Vernazza at 10:20am so it took us an hour from where the car was parked. The villages themselves are pretty from a distance, but they don't have a lot to offer except for the standard tourist fare...trinket shops, bars and restaurants, and outdoor patios. The train tunnel at Vernazza. It was pretty quiet...until the train arrived! It got a little busier. 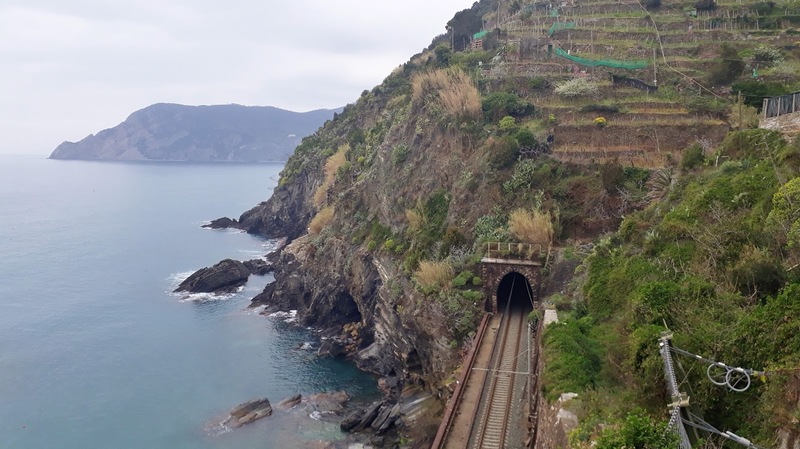 Many people take the train to Vernazza and hike only one section of the trail, to either Monterosso to the north, or Corniglia to the south. We've heard that these are the best parts of the trail system. We wandered around the town for a bit, then carried on towards Corniglia. You can clearly see the trail on the mountain looking back towards Monterosso. Our first sighting of Corniglia, with Manarola in the distance. Made it to Corniglia at about 12 noon. The trail was getting busier, with people in both directions, but not too bad. We would NOT want to be here in busy season though. What a zoo it must be! View from where we sat and had our lunch. We had been having an instant messenger conversation with Dwayne and Lyd...the Canadian couple we met in Torrevieja last month. It turned out that they were also checking out Cinque Terre yesterday and we were trying to see if our paths would cross at any time. They said they were taking the train to Corniglia, so we set off down the stairs to find them. Looking down the steps to the train station. We were also trying to figure out our own plan. 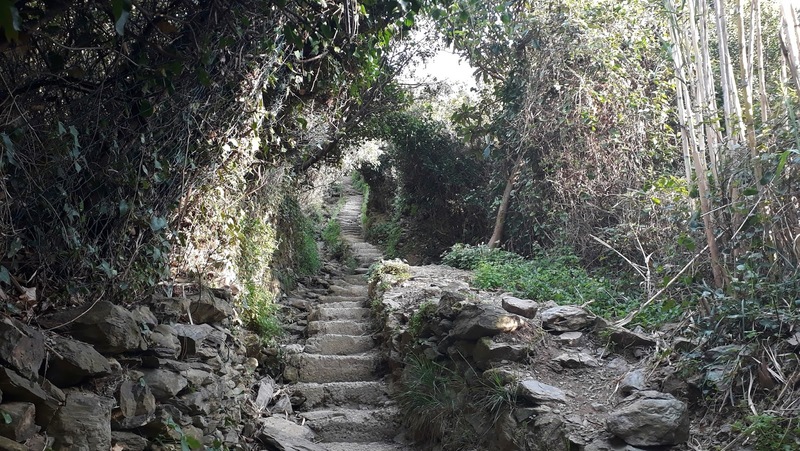 The coastal trail from Corniglia to Manarola remains closed from a landslide that happened in 2012. Apparently two levels of government are involved and they can't agree on who should pay for the repairs. In the meantime, the whole region suffers due to the closure. And it turns out that the section between Manarola and Riomaggiore is also closed for repairs! There are alternate routes available, but I had read that they are not very scenic, and they add a lot of distance. 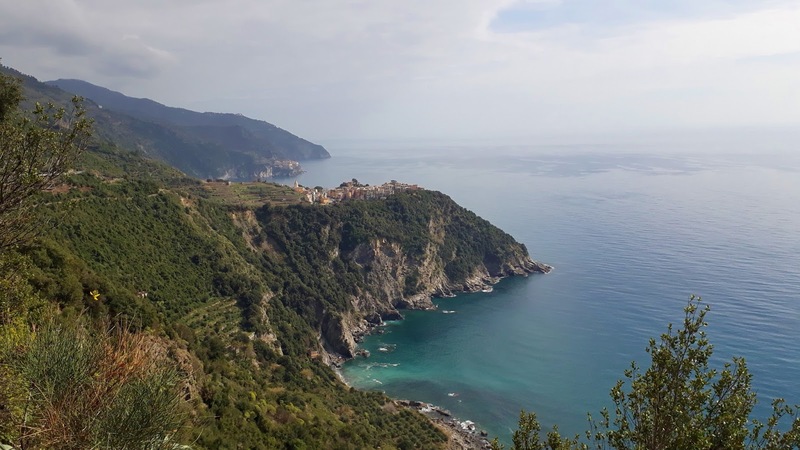 In fact, to get from Corniglia to Manarola was going to be 5.5 kms (3.4 miles). So we changed our plan. We would hike all the way back to Monterosso and not take the train at all. That would save us some money, plus we would see it in another direction. We did go down the 381 steps to the train station, and walked along the path, passing the signs that said the trail was closed. There were no barricades, but you can only get so far because there really is a landslide that you can't cross. We made it as far as you can go, the turned around. And headed back up those 381 steps! Oh well...we needed the exercise! And there, we bumped into Dwayne and Lyd. We set off heading north on the trail with Dwayne and Lyd. And what do you know, the sun appeared for about an hour! There are some pretty spots on the trail. 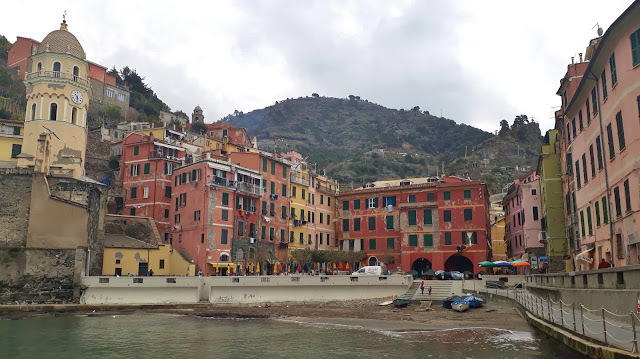 Dwayne and Lyd were hopping on the train at Vernazza, but we continued hiking on to Monterosso. The sun had disappeared once again, so I didn't bother taking any more photos of that section. From where the car was parked, we continued on down to Monterosso....down a whole bunch more steps that we were going to have to climb up again...all so that we could have some gelato! €2 ($2.90 CAD, $2.20 USD) each. And that's all the money we spent for the entire day. Oh, and I should mention...normally there are "toll booths" where you have to purchase a pass to hike the trails. And, we expected to have to pay. But the booths were all closed up, and we're guessing they only open during busy season, which we're likely starts April 1st along with the ferry boats that go between the villages. We arrived back at the car at 5:20pm. We had been gone for eight hours, and had hiked 19 kms (11.8 miles)! We were beat. And then we had a 50 minute drive to get back home. 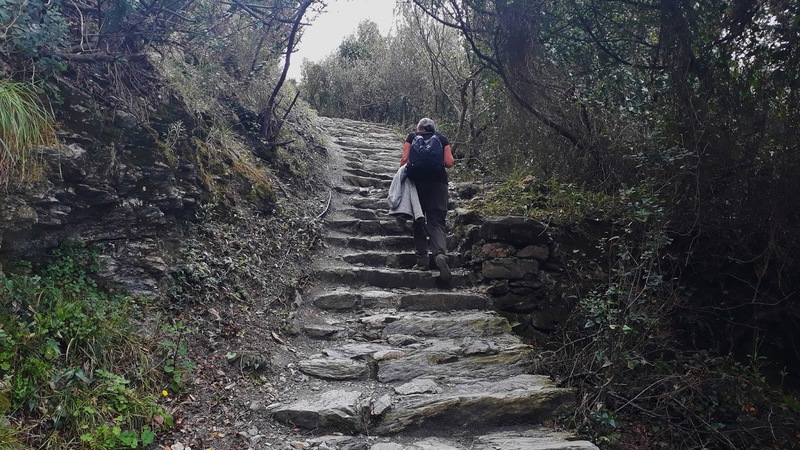 So, final impressions on the Cinque Terre hike? It's got a couple of really nice post card style viewpoints. Not as many as I thought there might have been though. The trail is well maintained, and considering the number of people who use it, it needs a lot of maintenance to be kept up that well. It's become far to popular though. Considering it's popularity, I honestly expected the hike to be better than it was. Don't get me wrong...it's definitely a good hike, and we enjoyed it. But I guess I had my expectations set too high and thought it was going to be something really exceptional. No way I would want to do it during the busy season. Can't see it being enjoyable fighting through the people on the sections where it's too narrow for people to pass each other. Really disappointed by the two closed sections. Shame they can't get their act together on getting it fixed. Overall, a good hike and we enjoyed our day! The photo of the village of Vernazza is beautiful. I think that trail is awesome. Your photos show so many different views of that area. I would be excited to see what was around the next corner. I agree...not during the busy season for sure. It is a beautiful village and very picturesque. I wish we could have made it to the last two villages because they are suppose to be gorgeous as well, who knows if the weather is nice, which it isn't suppose to be, in the next couple of days maybe we will drive to the last one and walk the inner trail to between those two towns and the third one. We will see. The trail is a hard one if you have troubles with stairs and steep sections and there is a lot of that on most of the trails. We are really happy that we did it. That sure was a good hike today and lots of great scenery, Nice that you met up with the other couple along the way. We loved the scenery and the challenge of the hike. Yep, it was pretty funny that we met up with Dwayne and Lyd again. The most we walked in one day was 10 miles in Ireland but not the hills and steps you did. That was in 1991. When we were there in the month of September almost ten years ago there was one area closed due to a slide. Now there are two... Bummer. We parked at the southern most town, took the boat to the northern most town and walked back, except for the part that was closed, there we took the train for one stop. It was sunny and hot! And the gelato was amazing as well as a well deserved beer at the end... Great photos! Yep, it was pretty disappointing that two sections of the coastal trail are closed and they looked to be nice sections too! :-( Still we enjoyed our time on the trails that we did do and definitely loved that gelato in the Monterosso before we had to make that one last big effort up all the stairs in order to get back to where we had parked the car. When we visited we hiked south to north, it was sunny, and the trail was entirely open, so we made it through all five villages. It was truly spectacular, particularly the first two most southerly stretches/villages. It sounds like aside from experiencing only a portion of the trail, you likely missed two of the most scenic stretches. Still, you now have bragging rights, and given you did the stretch with the most steps not once, but two times, official Cinque Terre jello legs! You were so lucky to have had the coastal trail open the whole distance, we were pretty disappointed that those last to sections were closed. I want to go back and drive to the most southerly town and hike the two inland trails to Corniglia but Kevin isn't sounding very enthusiastic about it as I am, plus the weather isn't looking very promising for the next few days. Kevin has found another coastal hike that he would like us to do though, it is a little further north so hopefully the weather will co-operate because it also sounds like a good one. Surprisingly enough, our legs didn't feel like jello but we were both pretty tired by the time we got back to the car, especially after doing the stairs back up from Monterosso at the end of the day. Wow, that's too much hiking for me in one day (I'm good for about 6 miles) but glad you made it! Pretty even without the sun. Thanks for sharing...guess we won't try hiking the entire trail when we visit in June 2019. Would probably be costly and way too crowded!! If you slowly work your way up to a longer distance you probably could do it. It is a strenuous hike though, especially coming down to the villages or up from the villages. It is also nice that you don't have to do the whole hike if you don't want too, you can take the train in between the villages that you don't want to hike too. If you are planning for June then yes, it will be much busier, you still might be ok if you go on a week day and it is at the being of the month rather than at the end. I am sure you will have a great time no matter what time you go, things may just be busier and cost a little more then. Looked like a great hike but way too many stairs for my poor old knees. Beautiful scenery throughout and lovely pictures. I heard the geleto in Italy is a whole lot better then what we get here will have to try one day! Enjoy the rest of your week so excited for you both. Never considered Italy as a travel destination but will have to reconsider! Yep, there were a ton of stairs both up and down! 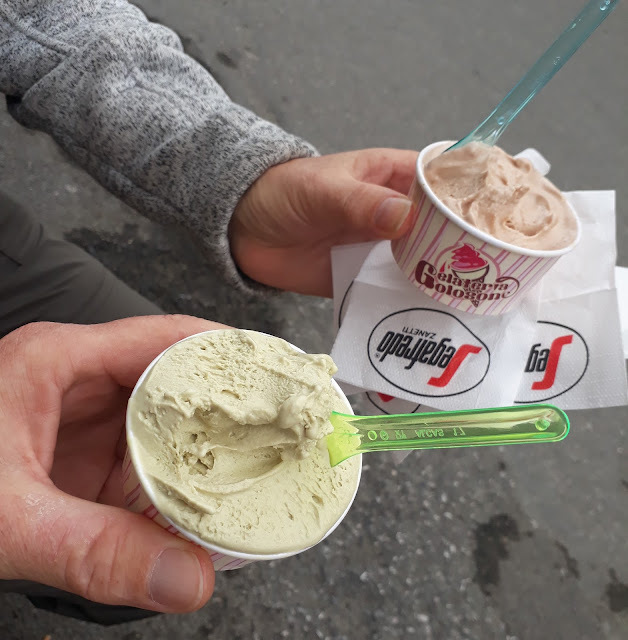 Italians are well known for their gelato and we are told that the majority of places all hand make it themselves. It is delicious and oh so smooth! Italy is amazing, however we seem to say that about almost all the places that we visit. Highly recommend a visit here, try to give yourselves lots of time, it may not look like a huge country but there is so much to see and do here it would take forever to do it all. Even small little towns have something to offer. We will certainly be coming back here for another visit, after all we haven't even seen Venice, Rome or Florence! Wie have done the trail 4 Years ago. In september, it was full season, but not so crowdy. <no problems, but we were disappointed about the closed "via d'amore". I can recommend La Spezia!! It is disappointing when the whole trail isn't fully open, especially that one section that has been closed for several years and still isn't fixed! We will try to visit La Spezia but we only have a few days left. We had wanted to go the other day but it was just too busy with the festival that they had going an we couldn't find any available parking. Too bad the ferries are not in service during low season, as you would have been able to get photos from the sea of the areas closed off for maintenance and because of the slide and photos of the parallel sea/land coastal areas. The ferries during low season would most likely not be crowded, too. We were looking forward to taking the ferry and seeing the villages from the water but unfortunately it wasn't meant to be. It would certainly have give a different perspective of the villages plus we would have seen the two most southerly villages that we missed because of the trail being closed. Very nice hike. Yep, the beauty of nature and being out doors. Pack your own lunch and drinks, stop and enjoy the views. The ice cream must have been a welcomed treat. Chris, you and Juan need to make plans to come here for a visit. We know you would both love it here. Hi Ruth and Kevin, My husband and I are going to Cinque Terre at the end of August. August 26th thru 31st. We can't wait. We are staying in Vernazza. This will be our fifth trip to Italy. Love it there. So far we've been to Venice, Florence, Rome, Sorrento which includes (Capri, Amalfi, Positano, Pompeii), Tuscany country side and visited 21 towns. This time around, we are flying into Pisa for one night, taking the train to CT, then taking the train to Venice (for our fifth time there). Venice is our favorite place. It's the first place my husband and I went to on our honeymoon. I loved viewing your pictures. Thanks for sharing. Sounds like you have just about been everywhere in Italy but I am sure there are still places that you haven't seen yet and probably still more that you don't even know about. You will have a great time but it will probably be pretty busy in Cinque Terre at that time of year. Since being in Italy, we haven't hit any of the big cities. We had our fair share in Spain so we are enjoying the natural side of Italy on this trip. Hopefully we will return and that's when we will see Rome, Venice and Florence. Ah well, life is full of little disappointments and we just take them in stride, and enjoy the heck out of rest of each day, right? Nice hike, regardless. Yep, it is a shame we didn't get to see those other two villages but we didn't let it dampen our spirit and we enjoyed our hike, along with the scenery and the exercise.